Imagine drifting along a wilderness stream with cedar and fir interspersed along the banks with grassy meadows and stands of white birch. The river alternates fast and slow – rapids and plunge pools linking tailouts and meandering bends. The water is New Zealand-clear. High above, cupping the green and pungent valley bottom, are the impressive peaks of Perry Ridge. Beyond that, the towering Valhalla range, domain of heli-skiers and mountain goats. 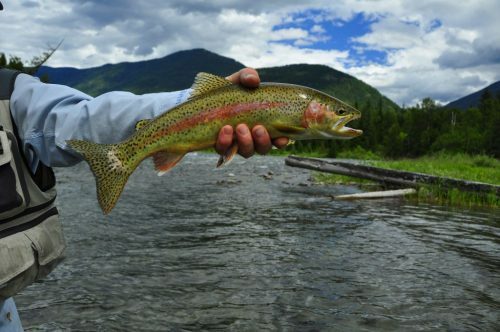 Welcome to the Slocan River, where miners once panned for flakes of silver, but Slocan River fly-fishers now pry wild,Redband rainbows from the undisputed jewel of the West Kootenays. 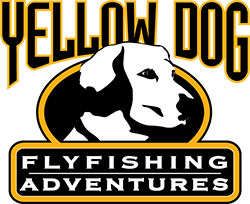 As is the case on the nearby Columbia River, Dave Brown Outfitters is the only full-time fly-fishing guiding service on the ‘Silvery Slocan’. In fact, DBO guide Chris Dawson, who heads up our West Kootenay operations, lives in a cabin overlooking the river. Sorry, Chris … we couldn’t resist! 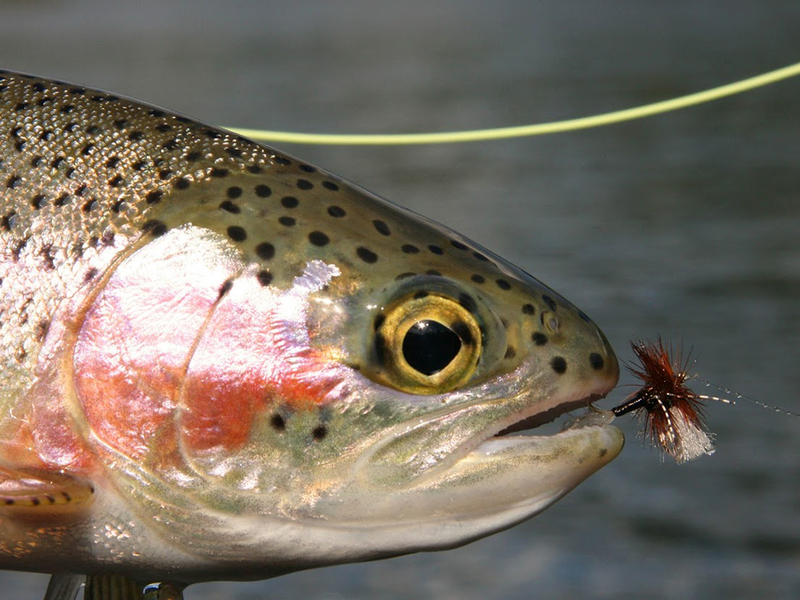 The Slocan River Fly-Fishing season starts in early July and ends with October caddis. 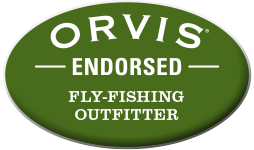 In between you’ll be fishing hatches of golden stones, PMDs, numerous caddis, BWOs, Green Drakes, red quills and midges. Terrestrials like hoppers, beetles and flying ants also have their time and place. 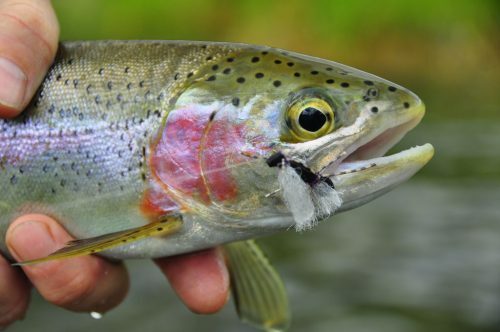 Truth is, you can match the hatch if you want, but the native rainbow trout are usually just as willing to eat a high-floating attractor pattern. Think Chernobyls, Fat Alberts, and other foam-bodied goodies. 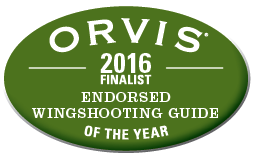 The valley is rife with wildlife and a birder’s paradise. Deer, black bears and bald eagles are common, and the abundance of vegetation and nesting habitat attracts a huge array of waterfowl and shorebirds. The Walter Clough Wildlife Area on the upper river is worth a separate visit if clients or family want a break from fishing. The Slocan River Valley itself is equally appealing. Whether you’re after roadside espresso or a potter’s barn, this is the place to be. Just be ready to lay back and put your feet up, because that’s the ‘Slocan Pace’. 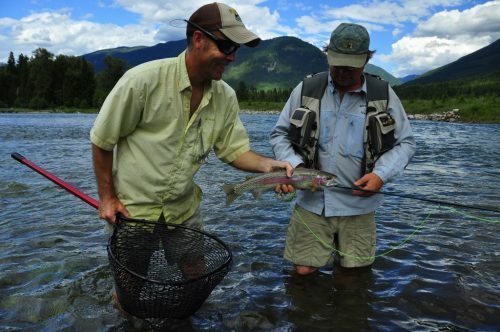 The Slocan River is a great addition to a Columbia River Fly-Fishing Trip. After spending a day or two fishing to steelhead-strain rainbows on the Columbia tailwater, the Slocan River Fly-Fishing will make you feel like you’re holding a wand instead of a fly rod. Because the Slocan Valley is well-sheltered and often calm, light rod-line combinations are ideal. 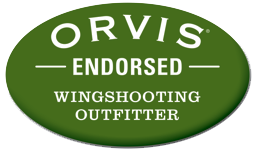 Three- and 4-weights are recommended – maybe a 5 if the wind is up or you prefer it for tossing bulkier dries. Short- to medium-length casts are the norm so distance isn’t a big concern. 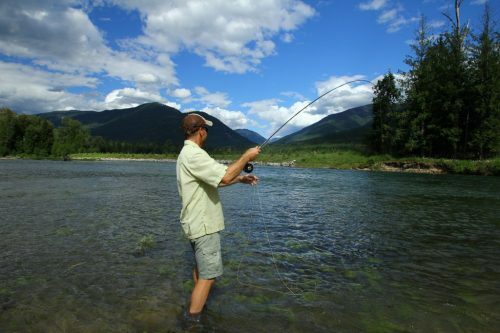 The entire length of the Slocan River is catch-and-release only, but the river also closes from July 15 to August 31 to protect the trout during the warmest summer period. As a result, come September 1 the rainbows are feisty and forgetful, and eagerly take dries well into October. Many anglers consider September the Slocan River’s finest month, with heavy hatches of caddis and red quills, which most locals refer to as blue duns. As the fall progresses the large October caddis increase in numbers, and the trout rise eagerly to orange-bodied Chernobyls. There are good numbers of rainbows from 12” to 15”, with the occasional fish up to 20”. Seeing a trout like that rise to your dry fly from the bottom of a Slocan River pool is heart-stopping. We mainly fish dries, but when the trout aren’t feeding on top any medium-sized nymph pattern will work. We like to tie beadhead #14 Pheasant Tails or Copper Johns a couple of feet beneath a yarn indicator and shallow-water nymph. 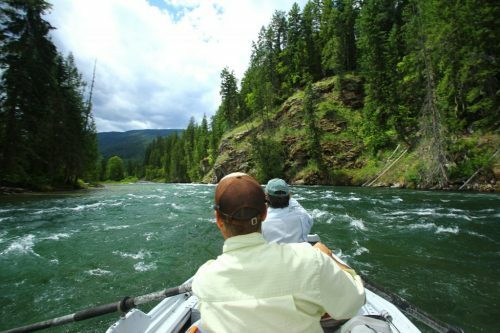 For those seeking the ultimate Western Canadian fly-fishing adventure, we suggest combining a West Kootenays trip with several days Fly-Fishing The Elk River out of Fernie in the East Kootenays. It’s a great way to catch wild, steelhead-strain rainbows and native westslope cutthroat in one epic trip. 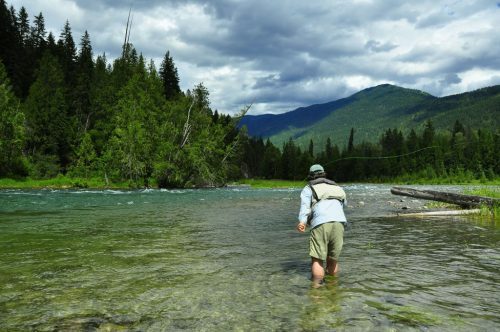 Better yet, it’s only a 4-hour drive from the Slocan Valley to Fernie; we can ensure you don’t miss a day’s fishing because Dave Brown Outfitters offers a tremendous walk-and-wade option at the halfway mark. Non-fishing companions can choose from a multitude of activities in the Slocan area, including hiking, mountain biking, lake boating and kayaking, whitewater rafting, birding, horseback riding and golf. The City of Castlegar puts you at Ground Zero for the Columbia. Both the Sandman Inn and economy-priced Quality Inn are central to restaurants, bars, coffee shops and convenience stores. We’ll arrange to pick you up – from there it’s a short hop to the river and the put-in of choice. For those seeking urban accommodations with a ‘hip’ flavor, we recommend the vibrant mountain community of Nelson – just 25 minutes from the upper Columbia. Long considered the “funkiest” town in the B.C. Interior, Nelson is beautifully perched on the hillside above Kootenay Lake and famous for its heritage buildings and eclectic flair. The centrally located Hume Hotel is a Nelson mainstay; other options are the upscale Prestige Lakeside Resort, Best Western on Baker or any of the numerous B&Bs in the area. If you’d prefer to stay off-the-beaten-path in the rustic Slocan Valley, we recommend Lemon Creek Lodge. 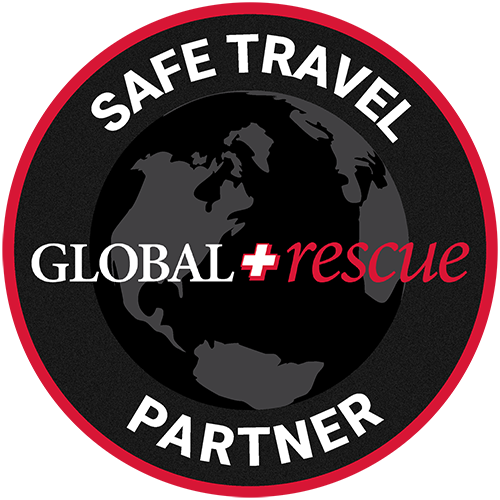 But be forewarned – there’s no cell coverage in this idyllic backroads – just a world of peace and quiet!